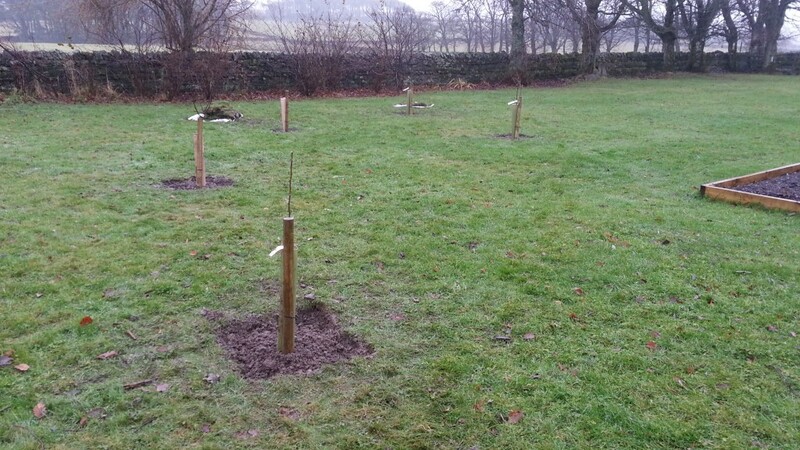 I had ordered 5 fruit trees some time ago but it wasn’t until I came to plant them last weekend that I found myself pondering whether my efforts would qualify as an “orchard” or even if there was a formal definition which specified a number of trees. In my mind, the term implies a fairly large number of trees and conjures up images of west country cider orchards which gnarled old trees laden with fruit. The trees I bought are only 1-year-old and arrived bare root so they’re not much to look at right now. As a result of all this I was perhaps understandably hesitant to use the term “orchard” when referring to our limited number of trees. After all there are only 3 apple trees (James Grieve, Meridian and Queen Cox), 1 pear (Concorde) and 1 plum (Victoria). An orchard is an intentional planting of trees or shrubs that is maintained for food production. Based on that definition, I can confirm that the picture below shows our newly planted orchard and I’m looking forward to the first harvest in a couple of years! Trust me, it’s an orchard! Sounds, and looks like an orchard to me. The Northern Fruit Group http://www.northernfruitgroup.com have a good list of trees suitable for this part of the world!! Thanks for the tip, I’ve not heard of them before!